The HTC One (E8) features a 5" Full HD IPS display with a pixel density of 441ppi, the same one that's found on the HTC One (M8). It's covered by Gorilla Glass 3 and accommodates almost permanently visible on-screen navigating buttons. 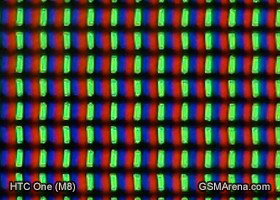 Taking a closer look at it under our digital microscope proves this, as the two panels show an identical RGB pattern and pixel size. Running our display test again provides very similar findings, with the E8 providing marginally better contrast at 50% brightness, and the M8 being more contrasty at 100%. The HTC One (E8) has a respectable sunlight contrast ratio as well, resulting in a score that places it in the upper half of our sunlight legibility charts. Has the same 2,600mAh non-removable Lithium Polymer battery as the HTC One (M8). While the M8 was able to post a respectable 71 hour endurance rating, the E8 is able to do even better. While the E8 doesn't do as well when it comes to 3G talk time, it makes up for it with over 10 hours of web browsing, and over 11 hours of video playback time. Overall, this results in a 77 hour endurance rating, which means that you can use the HTC One (E8) for over three days and do an hour each of calling, web browsing, and watching videos each day, and still have some left in the tank. Standby power draw is included in the calculations, though the exact number isn't listed in the scorecard above. 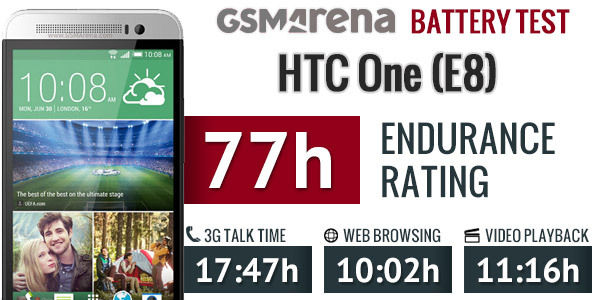 You can find more about the HTC One (E8) battery life in our blog post. Details on the testing procedure can be found here. 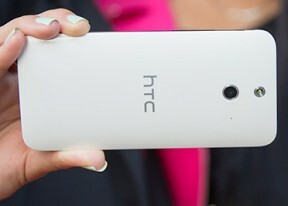 The HTC One (E8) packs a solid set of connectivity features, with a few omissions compared to the M8. You still get quad-band GSM, 3G, and LTE support. The local wireless connectivity has Wi-Fi a/b/g/n and DLNA support (both client and server, for images, videos and music) and stereo Bluetooth 4.0 with the higher-quality aptX codec. There is no Wi-Fi ac support however. The lack of an IR emitter is another glaring omission, too. HTC has conveniently designed a special options screen, when you connect the One to a PC. The long list of options includes Portable Wi-Fi hotspot, settings, USB and Bluetooth tethering (the phone becomes a modem). 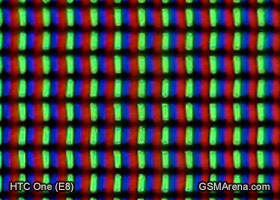 NFC connectivity with Android Beam is present too. We found it to work with no hiccups. There's a microSD card slot too supporting up to 128GB of storage. In addition, the device also comes with 50GB of free Google Drive storage for two years. Unfortunately, compared to the One (M8), the microUSB port of the One (E8) lacks TV-out functionality and there is no support for USB host or USB On-the-go.